Mardi Gras is over and now all you have are your memories and probably LOADS of beads. Some are definitely keepsake material while others not so much. The easy answer has always been to throw away unwanted things but now it's just as easy to recycle! There are several organizations out there who will take your beads to be reused. Arc of Greater New Orleans has "for over thirty years created wage-earning jobs for individuals with intellectual disabilities by collecting, sorting, & repackaging Mardi Gras throws." So not only are you helping with the clean up of our city but also giving people a chance to support themselves! The Occasional Wife will be doing a bead drive with recycling bins from Arc so if the other donations places are too far out of the way for you then come on by the store! Visit Arc here for more information on donating locations, buying beads, or volunteering. What if you don't want to get rid of them? If you're a nostalgic person or you have kids who would be very unhappy with you giving those beads away then here are some DIY projects you can do with the whole family. Who doesn't love a beautiful and welcoming wreath on the front door? This diy is pretty easy and you could definitely let the kids help! Coasters can be used year round and I'm sure you have beads of every color. Make some coasters for the next holiday like St. Patrick's Day or make some for every day use with gold or silver. Now this one I think the kids will really get behind. An awesome beaded monogram to hang on their door. Another simple one to make that you can include the kids in. I know you are probably saying why would I decorate a pumpkin right now but put this away in your crafts folder for fall. I mean, look at how cute it is! The concept for making other DIY decorations (vases, jars, bottles) will be pretty close to how this pumpkin was made. 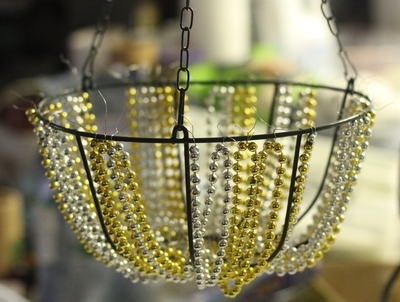 And last but not least you can make an amazing beaded chandelier! The options are endless if you want to get crafty. Or recycle! Either way you win! Thanksgiving has come and gone, the Christmas dinners have just finished and before you know it'll be New Years. This is the perfect time to clean out the fridge and pantry. Start out 2018 with an organized, clean and clutter-free home! This is a bit annoying but the best first step is to take everything out of your fridge and pantry. You want have an empty open space to start from scratch. This is especially important if you haven't cleaned these out in a while. There is most likely some expired goods in there. As you are taking everything out make two separate piles: Expired and Good to Use. Over time there may have been spillage in the fridge. Take this moment to wipe it down and get a nice clean surface. As you start to return the goods to the fridge give these a little wipe down too. With the pantry start with the can goods. These last the longest out of of anything and can be put somewhat towards the back. If you tend to buy in bulk then stack the same can goods on top of each other. Such as two cans of peas or two cans of tomato sauce. Something my family does is also group can goods together that are in the same recipe. You want the items that quickly expire towards the front such as bread, chips, cookies. Same idea with the fridge... extra butter can go in the back and fresh veggies up front if you don't have a veggie drawer. Designate the shelves to similar items as well. If you have three tier shelving in your fridge then keep drinks together on one, dairy and goods like eggs on another and larger pieces of meat on the bottom. So with the New Year approaching I'm sure we will all make New Year's resolutions to eat healthier and cook more at home but sometimes you just gotta eat out! To make your resolution easier, create a small space in the fridge for takeout. If this fills up then take this as a sign you need to cook a nice healthy dinner at home. We all need little reminders! These are a few tips on getting you started on a clutter-free home. Remember, if this feels overwhelming then please give us a call so we can help! Gifting can be hard. You want to get something that your family or friend will love and cherish. And we can all agree we don't want to add to anyone's clutter in their home. In the "old" days you would take pictures on a camera and have the film developed. A lot of times you didn't even know what was going to come back. Very exciting times. This most likely resulted in a hall closet full of stacks of photos. During Thanksgiving or Christmas you probably find yourself sitting on the floor with relatives reminiscing about the past. You've also probably run across several photos of nothing. The usual response is to stuff those back into the package and move on. Hey, I've done it. It's the easiest way but in the end you have lots of photos you don't need taking up precious storage space. Like I said, if you find yourself reminiscing during the holidays take this time to get rid of the bad photos. Bring over a big trash bag and just start going through them all. Have the younger kids make a game of it. Don't think of this as work. Think of this as a time with family. Don't let this word scare you. This is the easiest way to downsize on photos. Hard copy photos are usually stored away in an attic or basement and never taken out. Scan these photos to your computer, send them into a scanning company or hire someone (like The Occasional Wife) to scan them for you. The photos will stay as beautiful as the day you took them and will be at your fingertips and ready to be sent over to loved ones. Gallery walls are in and on trend in home design. 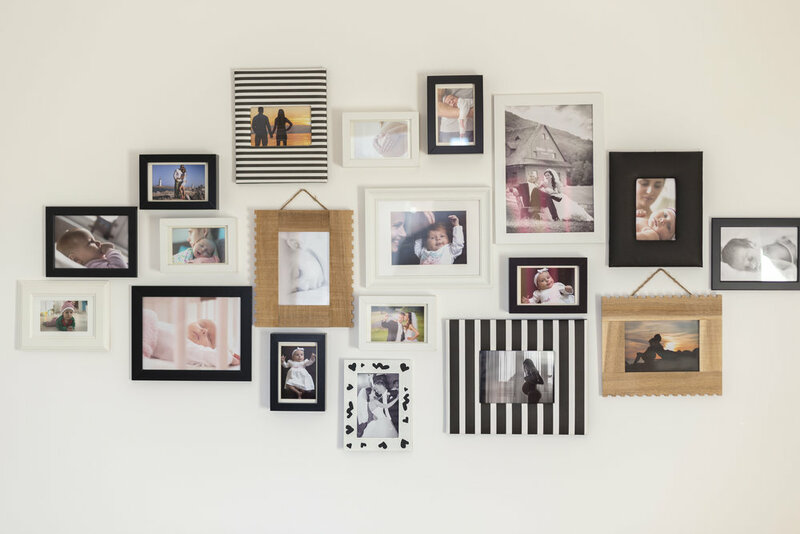 Have one wall dedicated to family photos in some beautiful frames. You can have them all match for a clean sleek approach or get all different ones for shabby chic. This is a fun way to decorate and keep the family memories alive. Let's get creative! Take some of the photos and some Mod Podge and make family ornaments. This is another great way to get the family and spend time together. You could get a glass top side table and put a photo collage underneath. Make a wreath with family christmas photos. This possibilities are endless! This is a hard one that even I have trouble with. Once you've backed up your photos you should really get rid of the hard copies especially those that are damaged. You can also donate. Many people love old photographs and creating something from them. Or give them to other family members. It is always hard to get rid of something sentimental but if you hate the way all of the photos have taken over your house then something must be done. This all comes back to having a happier home. Part of the charm of living in this city is the older beautifully built homes. Living in a shotgun or antebellum home you get details you wouldn’t get in a modern home: the high ceilings, crown molding, and the unique architecture to name a few. And both of these types of homes have one definite similarity. Small closets. In the yester years people didn’t have disposable clothing like we do now. You know what I’m talking about. The shirt, from Forever 21, that after a few wears falls apart or the 2 for 1 pants deal at Target that you couldn’t resist. We just have more. But in these older homes there’s nowhere to put these things. That’s where armoires come in. As New Orleans residents you probably have at least one armoire in your house. Or have rigged up a shelving device for all your shoes. Either way you’ve had to become creative with your storage. Armoires are functional in many different ways. Shoes, clothes, costumes, electronics, you name it, can go in these and once the doors shut the clutter is gone. And these armoires, especially the antiques, are beautiful, so why not utilize them? The Occasional Wife has new and antique armoires of all shapes and sizes for a fraction of the usual price. However, there are a few tricks to choosing the perfect armoire. You don’t want to bring in a mammoth armoire (no matter how pretty) into a narrow one bedroom. It will overwhelm the room and make everything look smaller. FYI the goal is the make the place look neat and larger! And buying the right furniture makes this possible. An armoire can be a statement piece but it shouldn’t be the only thing your guests are staring at because it stands out so much compared to the rest of your furniture. For the most part, armoires are usually wood and aren’t made to stand out. But there are a few that are wonderfully painted or have a specific eye catching design. Don’t buy it if it doesn’t go. In a living room full of beige and white with pink accents don’t get the one with the roosters painted on it. Armoires are all different on the inside like unique little snowflakes. They have shelving or drawers or a cut out back for a tv. Why are you buying this specific armoire? For a entertainment system you will want the cut out on the back for the cords. Do you need it for intimates? You will need drawers so these can be organized and separated. Do you need hanging space? In the armoires designed for TVs there is a large open space that a hanging bar can be added to. These all need to be taken into consideration when getting an armoire. You want to get the most bang for your buck and use the armoire in the best way possible. These ideas may be common sense to some but they can be easy to forget when you see a gorgeous antique armoire calling your name. It’s best to go in knowing what you want and need. Now get out there and find your perfect armoire! Why Declutter And Why Now? If you’ve ever decluttered a loved one’s home then you know how overwhelming it can be. The same goes for your own home. The feeling, once it is done, is a great sense of relief. Of course, even just thinking about these things can be too much to handle and that is why sometimes it never gets done. You may have heard of Marie Kondo and her “Life-changing Magic of Tidying Up.” It’s all about clearing the clutter to have a better life. The newest trend is now called “Swedish Death Cleaning.” The forthcoming self-help book by Margareta Magnusson is called “The Gentle Art of Swedish Death Cleaning.” The Swedish word version, döstädning, is a little nicer to read and hear. The main premise of döstädning is to clear the clutter before you leave this world. All of these trends are exciting to read about but they’re nothing new. In both Kondo and Magnusson’s books the emphasis is on what brings happiness. Kondo focuses on you and Magnusson focuses on your family and friends. If you looked around your home right now what could you name that brings you happiness? What could you do without? "It's a very emotional process." When the Occasional Wife goes to a home to help declutter we often ask the client when the last time the item was used or could life go on without it? You’d be surprised by some of your answers. Many times we overlook unnecessary items because that’s easier than dealing with them. You tell yourself “I’ll worry about that tomorrow.” Because really who has time? That’s where we come in. A stranger’s eyes are also much less biased than family members. We see things for their function instead of their sentimentality. And it’s okay to save keepsakes and heirlooms! No one wants a family history in the trash. But the pile of romance novels you picked up from the airport 10 years ago? Those can go. Beth Cathey, our Business Manager, was interviewed by Gambit for their article, "Helping an elderly parent downsize," to get more insight on what we do. "It's a very emotional (process), which is often why they hire us, because we don't have the emotional contact with the items," Cathey says. "Both the family and the parents can get caught up in the emotion by sitting there and going back through time, and they don't make progress." There’s no rush. If you want to work on only one room then that is okay. There is no set rule on how fast the decluttering needs to get done. If you want to go through every shoebox full of knick-knacks in the hall closet then that’s also okay. We know that these things are a part of your life and you may need to say goodbye. We will guarantee though, when you walk into your decluttered room, closet or home you will feel relief. The burden of holding onto all of those things will be lifted. You will know every item has a purpose or meaning. Your friends and family will be able to look at these things fondly instead of being overwhelmed by it all. Remember, that your home should always bring you happiness. You should feel joy when stepping inside. If it doesn’t feel this way then there needs to be a change. Don’t wait on happiness. Check out the full Gambit article here. For more information on how The Occasional Wife can help and what our services are please give us a call at 504-302-9893 or email info@theoccasionalwife.com.